I think this must be William Ackerman's favorite release as I am sure he holds Erik Satie in a close place near his heart since Satie is his favorite composer. As I was going through this album two things occurred to me, one, that this is the only serious classical album on a composer that exists from the Windham Hill catalogue, and second that since having no idea what Les Trois Valses Distinguees Precieux Degoute (Three Distinguished Waltzes Of A Jaded Dandy) sounded like after hearing it in a documentary about Black Mountain College, this is the first time I am seriously reviewing it after hearing the obvious and most popular Gymnopedies. When listening to this album you can begin to immediately notice that not everything is perfect. The piano is out of tune, the tempo for some of the pieces is a little off and there is a lack of emotion making the performances dry and almost mechanical. But the one strength that this album delivers is in it's nostalgic quality, that along with the mechanism and flat-sharp tone of the piano, can bring you back to simpler times, when times were easier, happier and the world made sense. If you studied music like I have, before going to college at the age of 19, then you might be brought back some sentimentality of memories of when you went to piano lessons as little kid between the periods of your own preteen and teenage years. The dry almost mechanical quality of the performances may remind you of a time when you were learning classical pieces, trying to understand emotion and preforming them in their imperfect result at recitals for friends, family, strangers and other students. As the album goes along you find that the dry-mechanism only exists with a few tracks finding yourself between emotion and thought as the album moves on toward the end. There is a personal exemplification in this that makes me understand why William Ackerman loved Satie so much and why he most likely recorded it for his new and budding label back in '79. For through the early music of Alex De Grassi and Ackerman's own is an example on why the music sounds the way it does and why it originates with a lyrical composer who was ahead of his time and never thoroughly acknowledged throughout his lifetime. For a performer that has trained with Charles Wilson, studied at the Interlochen Arts Academy and preformed with the San Fransisco Symphony, with a performer of that much training and esteem you can trust that as imperfect as the album might sound to some listeners it is backed up by a performer of high credibility. Non-classical listeners or a musically illiterate audience will find this album to be emotionally satisfying, simplistic and skillful as it will serve as a simple introduction into the music of Satie and into classical music as a whole. I suggest and am requesting consensus that Erik Satie be removed as "Artist" on this LP. 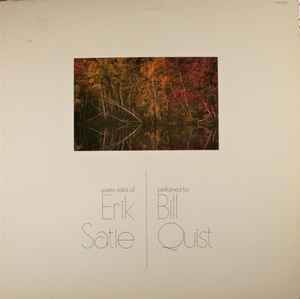 In Windham Hill's catalog, and on the spine of the record, Quist is the artist. The title of the release is Piano Solos of Erik Satie. Quist is the artist, playing Satie's compositions. Satie was of course long dead and had nothing to say about and nothing to do with the release of this record. He still gets composer credit and this disc will pop up in every search due to being properly credited, but the co-credit of Satie and Quist as main artists gives a misimpression of a duet or collaboration.